Hey friends! I am finally taking a minute to put up a post! 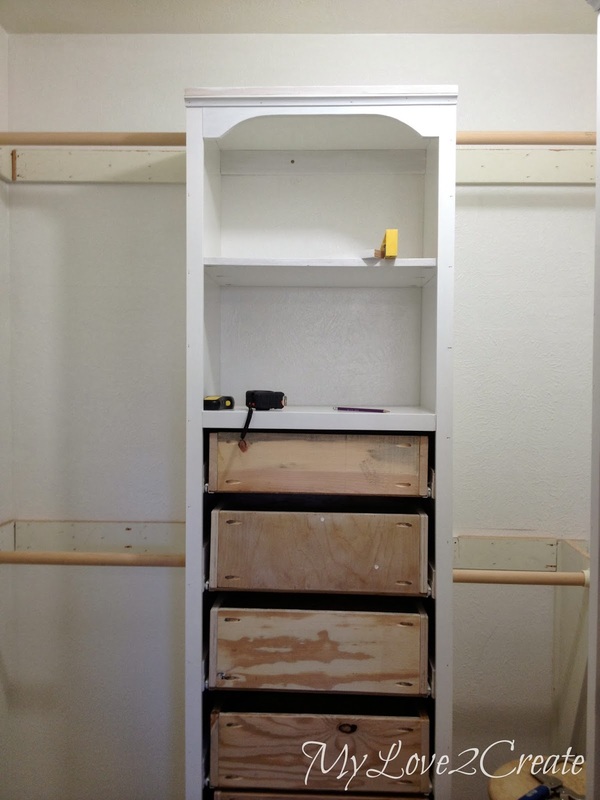 I am excited to share the next step in my master closet makeover. It is amazing what some trim, shelves and rods can do! It is starting to look good! You can see the middle board I added for support that I talked about in my last post. I didn't bother to prime it. If you look closely you can also see screws in all three support boards. They are screwed right into the studs anchoring the towers to the wall. Once the two towers were secured to the wall I started building the face frames. Then I nailed them onto the towers. I added a 1x2 to the top. 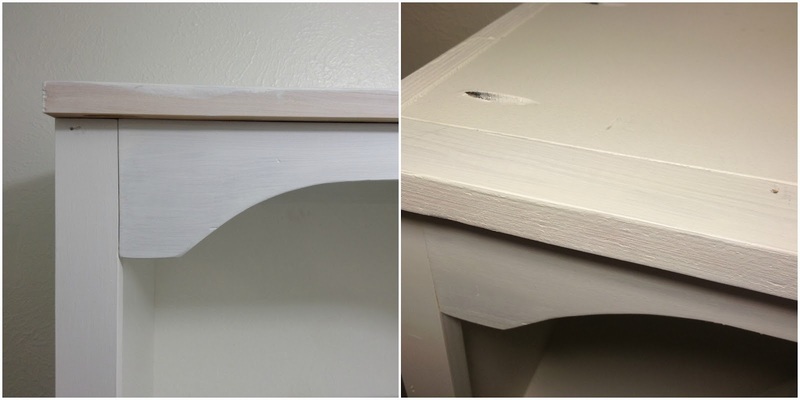 I really loved adding the trim it makes such a difference! 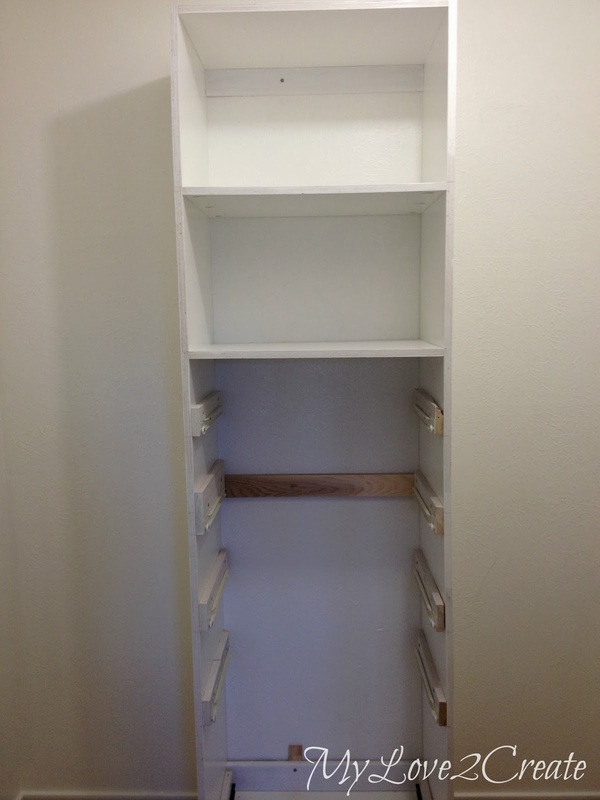 I also added 1x2 trim to the fronts of the shelves. Up to this point in my closet makeover I have used the wood I originally purchased from the store, with the exception of the drawers, those were made with scrap wood. For the shelves above the rods I stated reusing the original closet shelving, and some scrap wood. 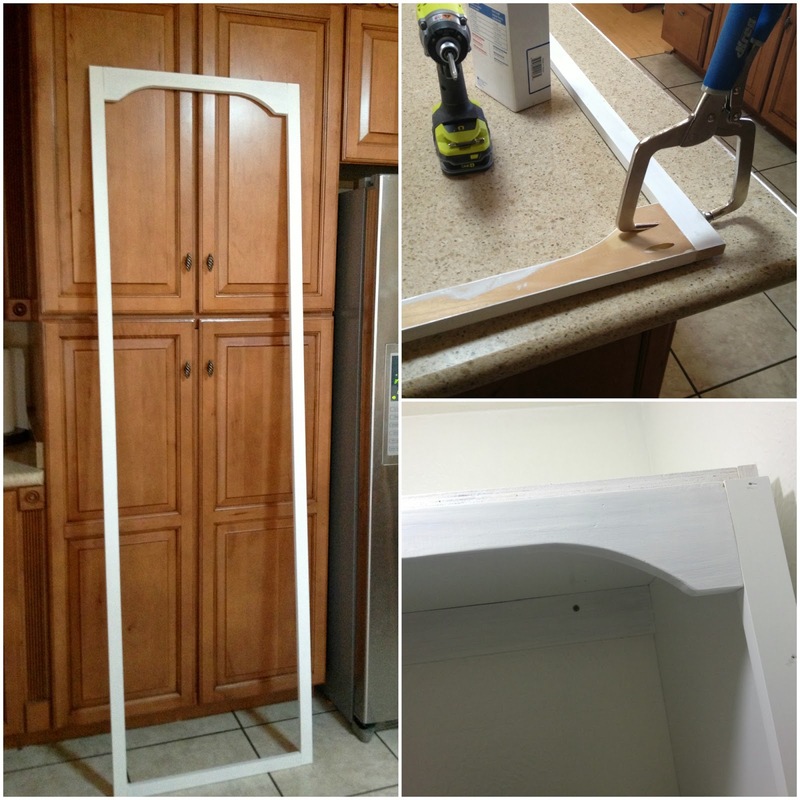 I started by reusing the closet divider that I had in my previous closet. I cut it down a little and removed the top piece. I am using this so I can hang my long dresses in the corner, I don't have many. 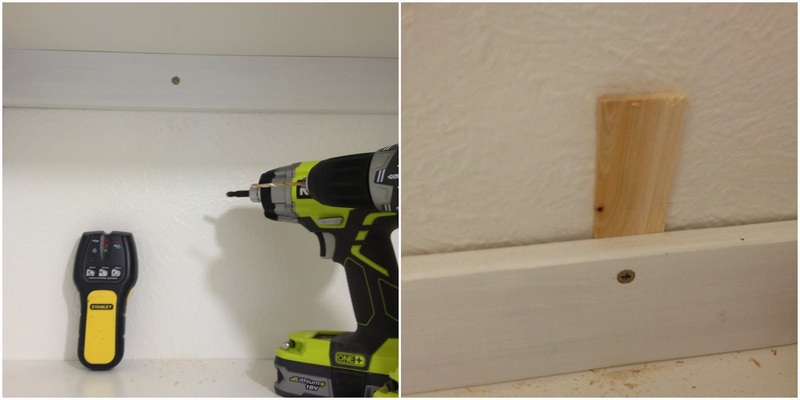 I located and marked the stud, set it on the wall, checked for level, and started screwing it into the stud. 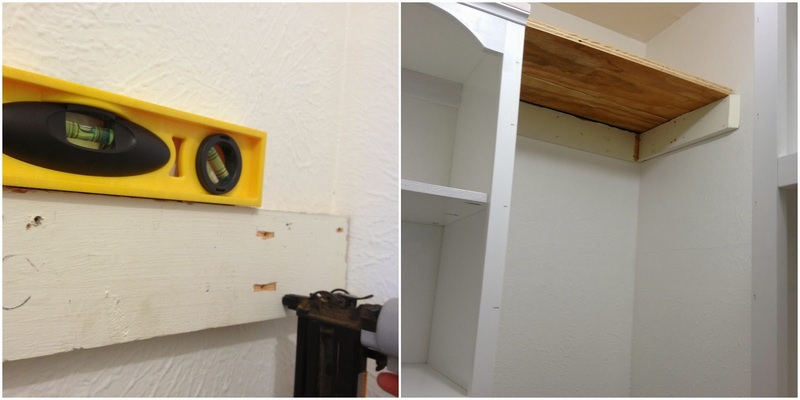 In the right photo above I was trying out the shelf I had cut, it is not nailed down yet. I reused all the old shelf supports cut them to size and started installing them on both sides of tower one, on the back wall. Again, I am trying out the shelf I cut on the right photo above. One side down...and I still haven't nailed on the shelves, I didn't want to do that until I had the rods installed. 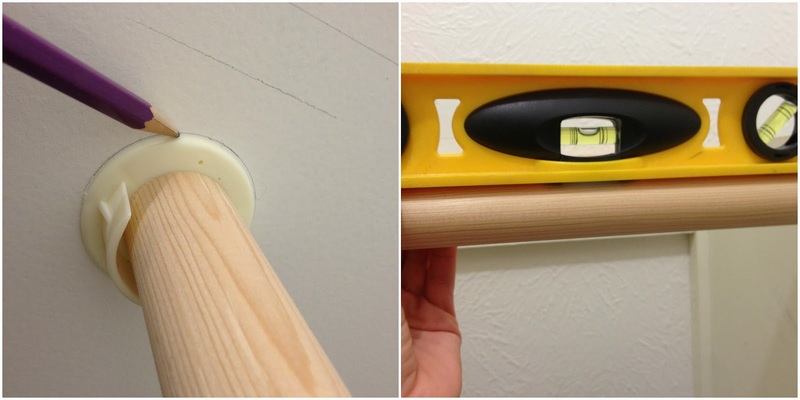 I bought the really cheap plastic closet rod holders (somewhere around $1.50) and a rod at home depot. I followed the directions and installed them. 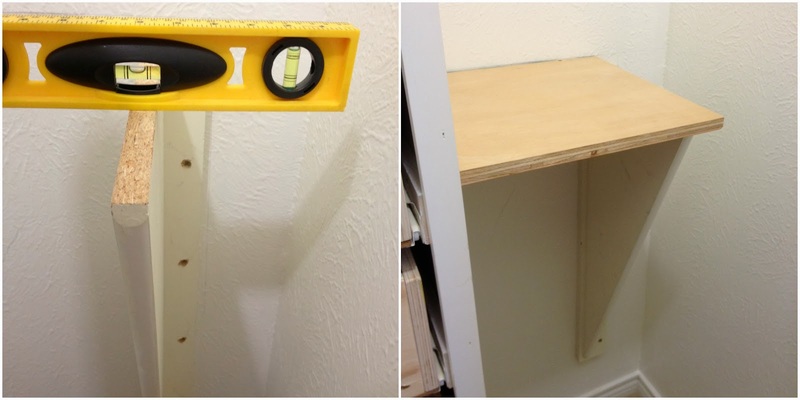 In the left photo above you can see I drew two lines where the shelves would go and then measured down to install the holders. 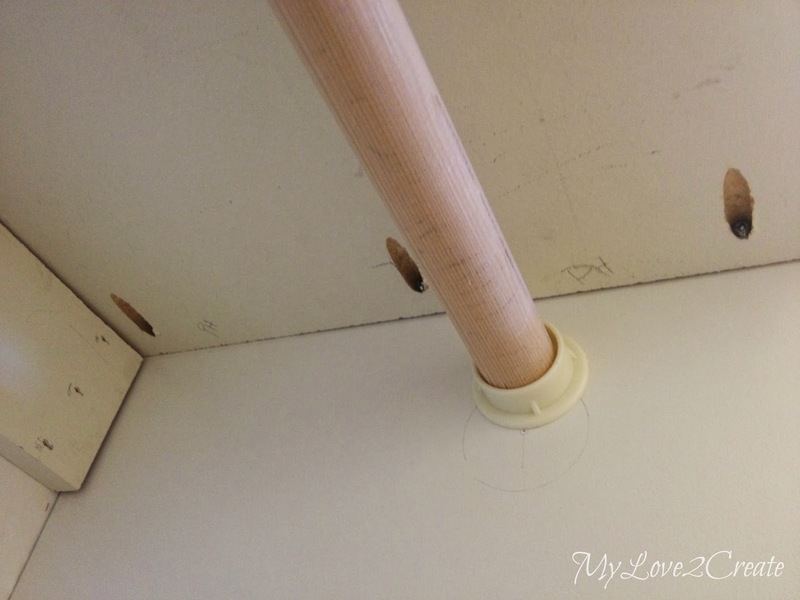 I carefully measured and cut the rods, and still had to run out side and cut them down a little more... Once one side of the holders was installed I set the rod in to the other side and slid it until it was level, then I drew a circle around the holder so I knew exactly where to drill in the second holder. I finally got all four installed! Now to add the shelves. I did not put a shelf support on the sides of the tower. 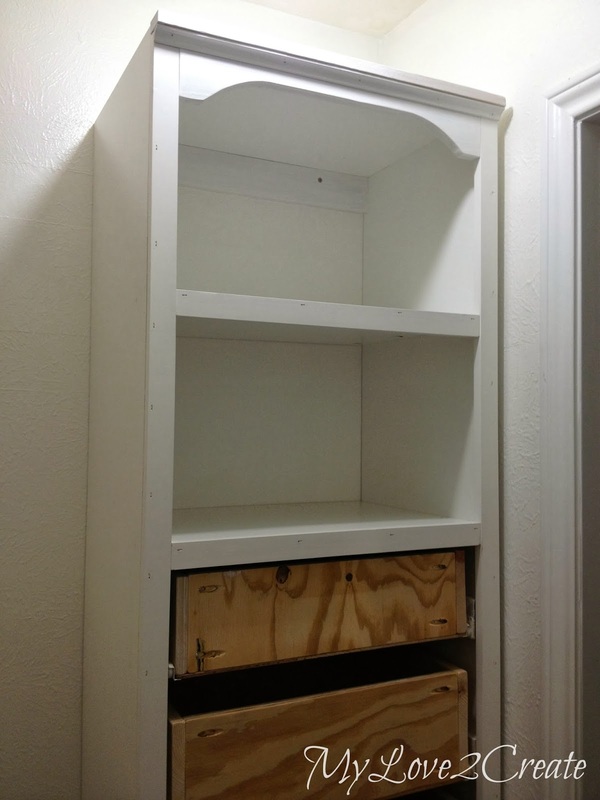 I drilled pocket holes to attach the shelves directly into the tower. This is under the bottom shelf. On the top shelves I drilled the pocket holes so they are on the top, and you don't see them. Once the shelf was secured with pocket holes I nailed from the top of each shelf into the support boards on the back and sides. Above you can see where I had to redo one of my rod holders, I am glad I caught that mistake before I drilled it into the tower! I wanted to test out the clothes after I installed my first rod. 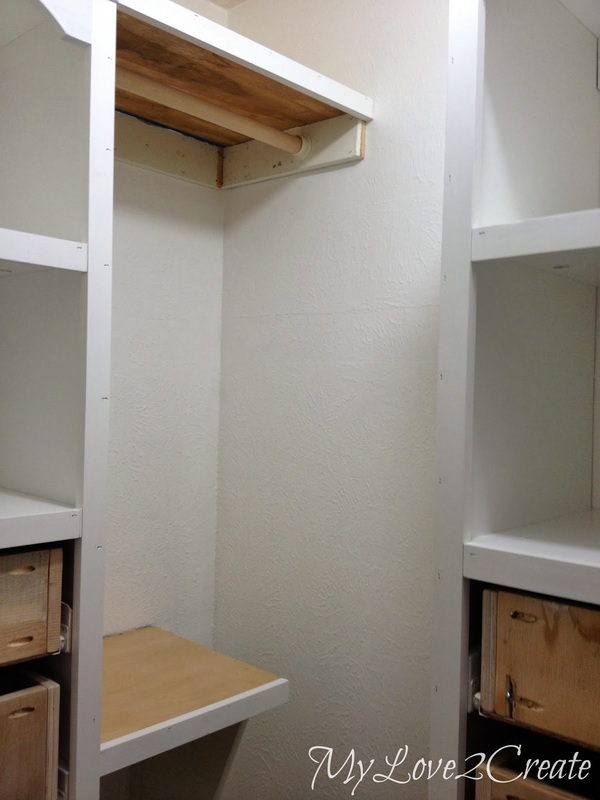 I also took measurements with the clothes hanging so I knew how long to make the bench that will be going just to the left of the door when you walk in. Sorry this is such a blurry photo, it is so hard to remember to check when you are in project mode. on both sides. The shelves on the left side of the tower were cut down from the old closet shelves, that is why they are already painted. Here is a shot of tower two with trim. You can also see I added a piece of cove moulding under the top 1x2, it adds that finishing touch, and yes it was free. One of my scores from the craigs list free section was a ton of moulding, I have been saving for a day such as this! Not bad for a day's work! At this point, my husband was finally starting to see my vision and I think maybe some doubt flew away in the wind...for both of us. 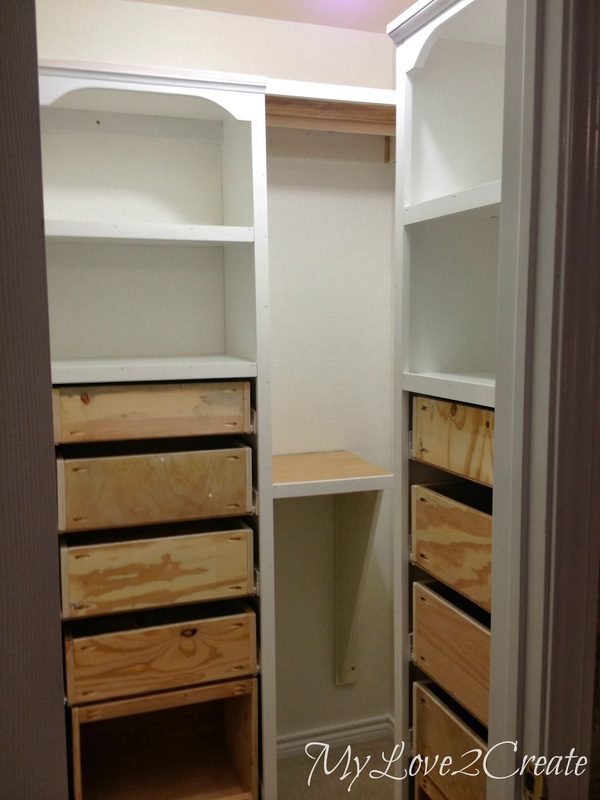 Maybe I am not crazy after all, and this closet just might turn out! I have some more work done and am pushing hard, some days are better than others. My littlest guy got croup and I was up with him all last night, poor thing. So I am hoping to finish next week! Thank you so much for all you sweet comments and encouraging words, you are keeping me going! It's looking fabulous - we're doing the faux front finishes on our billy bookcases - hoping they come out as beautiful as yours did! What a difference your face frames and trim made, just finishes the towers so nicely! Amazing to get all that done in a day! Aww...so sorry your little guy got croup. :( Give him extra hugs. 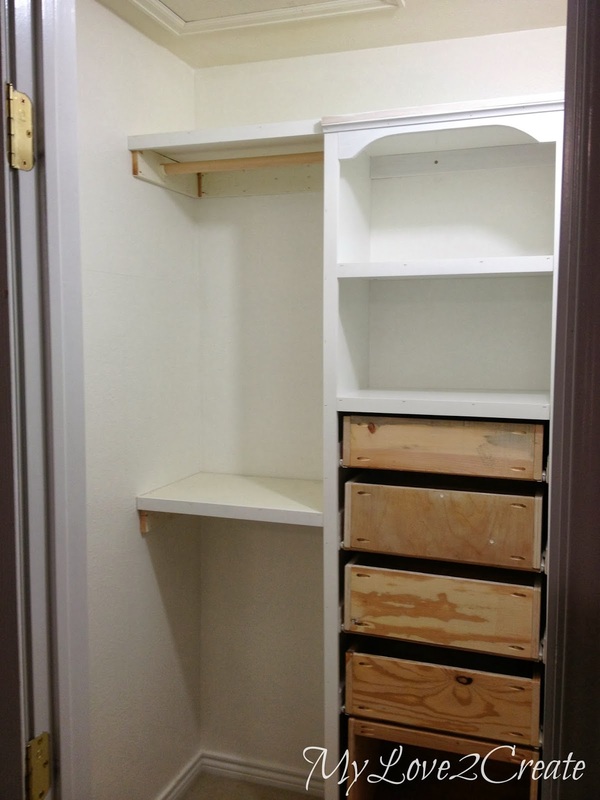 Thank you for the inspiration and the reminder of an unfinished closet I need to get done...one day. gotta love those little touches, and being FREE is the best part! I always forget to check Craig's List on a regular basis. my favorite part is the detail the front facings give your look! :) very pretty. Hope your little one feels better soon, Mindi! Closet is looking awesome. Maybe I will be brave and try to update mine too! Hi Mindi! 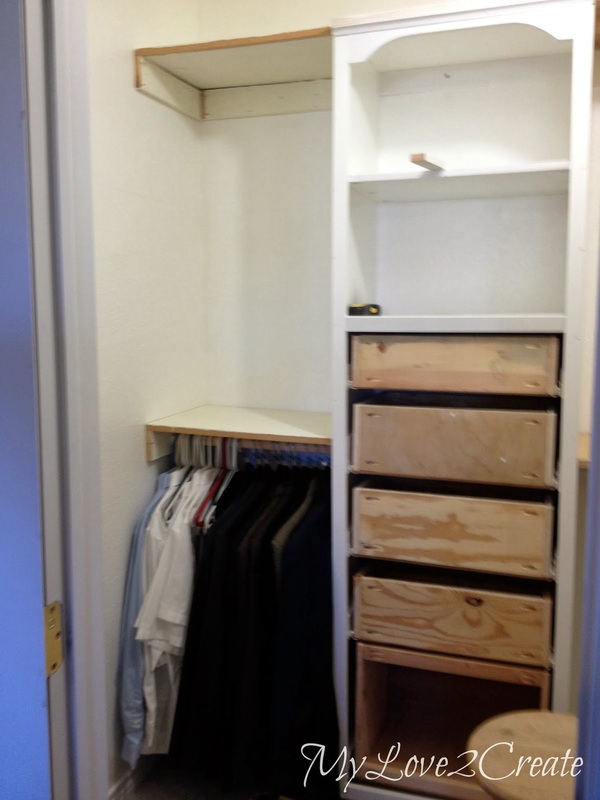 Your master closet is looking AMAZING! All those drawers are going to be awesome and I love how you are trimming everything out. Awesome! We redid our closet and I couldn't be happier. OK maybe if it were bigger!! But yours is looking great. Oh Mindi, I love the detail on those shelves! yeah, trim transforms everything :) You go girl, you're almost done! Im really proud of the work you did and i admire the great job and detail that went into it! Im building a house and im looking for all kinds of deals to save money, this is a great one for me to show my builder! This looks great! I love the detail you're putting into it! Can't wait to see it finished! This looks great! 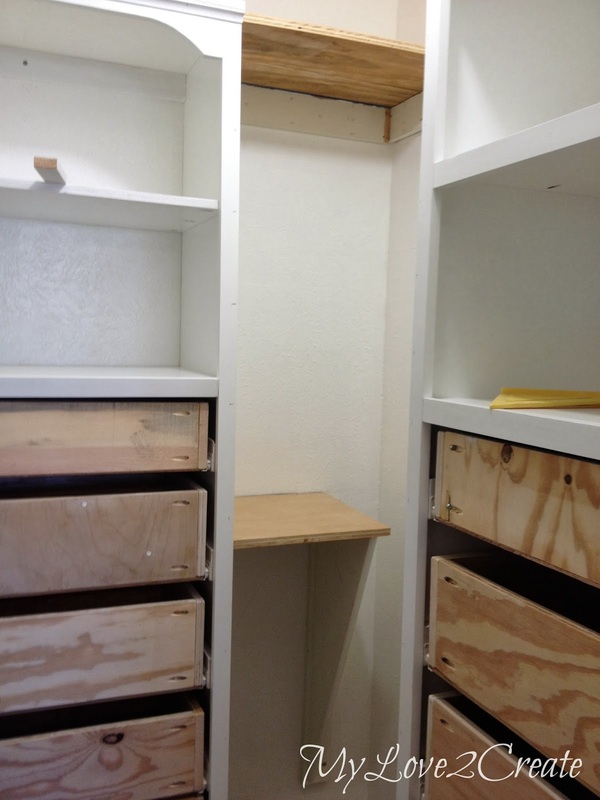 I need to makeover my closet badly. Can't wait to see the finished product. Visiting from Do Tell Tuesday.